To commemorate her transition out of silent films and into talkies, Edward Steichen photographed American actress Gloria Swanson in 1924. A pioneer in the field of fashion photography, Steichen would build a prolific body of work capturing the glamour of Hollywood’s Golden Age. In Swanson’s portrait, Steichen suspended a piece of black lace directly between Swanson and the camera, capturing what he later referred to in his biography as “her look of a leopardess lurking behind leafy shrubbery, watching her prey.” For Interview Magazine’s September 2011 issue, photographer duo Mert & Marcus shot a widowed Anne Hathaway veiled in black lace. 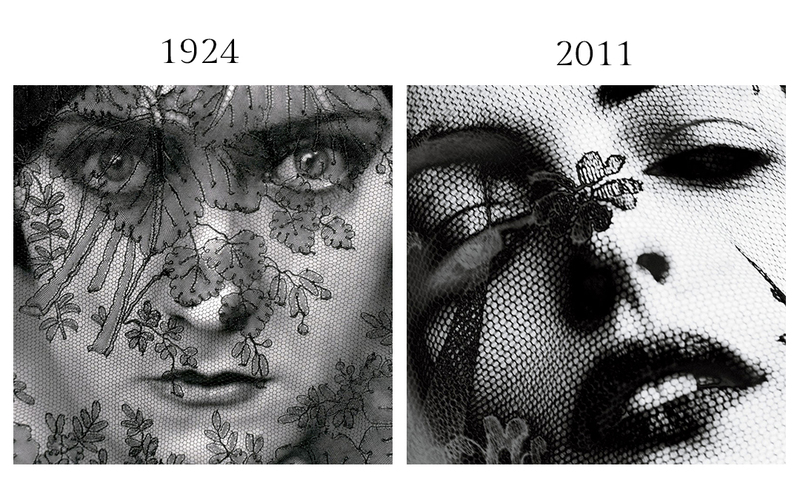 Although more prey than predator, Hathaway’s lace covered visage bears semblance to that of Swanson’s in Steichen’s famous portrait.